Please check below to order Kosher sealed scroll. 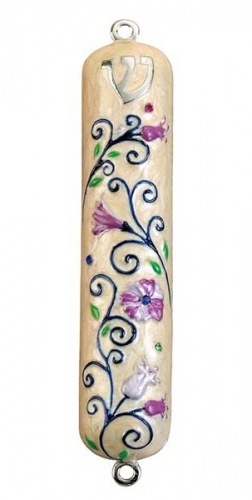 Beautiful Jeweled and enameled Mezuzah Case delicately depicting flowers with pink and purple petals with an ivory background. Mezuzah Case by the artist Jenji is 5" height. Silverplated back is open for easy inserting of Kosher Scroll. Silver shin is depicted on front of Mezuzah. Floral Enameled Mezuzah Case with rhinestones is from the Judaica by Jenji collection. Her designs are sure to enhance and beautify your home. Makes a wonderful Bat Mitzvah gift. Measures 1.00" w x 5.00" h.
As an option, please select kosher sealed Certified Scroll. Either a small (2.5" x 2.5") or large (4" x 4") scroll will fit. We can insert scroll for you if requested. We are very happy with the Huming bird Flower Mezuzah. We are pleased with the quick delivery and the mezuzah is very colorful.